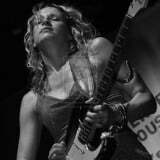 The featured image for this entry is of Ana Popović, a Memphis Tennessee-based blues guitarist, singer and songwriter. She was born on May 13, 1976 in Belgrade, Serbia, Yugoslavia [aged 39 years in 2015]. Her father, Milutin Popović introduced her to the blues, and she started to play the guitar when she was fifteen. Her recording labels are PGP-RTS, Ruf Records, and Eclecto Groove Records. Since 1999 she has been a solo performer, prior to which, she formed a band in the Netherlands named Hush between 1995 and 1998, appearing alongside Eric Burdon, Taj Mahal, Buddy Miles, Double Trouble, Eric Gales and others, on Jimi Hendrix tribute album ‘Blue Haze’. In 2001 she released her solo debut, ‘Hush!’ through the German label Ruf Records. In 2012, Ana Popović moved to Memphis, Tennessee. She performed at the New Orleans Jazz & Heritage Festival in 2013.